Service Bus metrics give you the state of resources in your Azure subscription. With a rich set of metrics data, you can assess the overall health of your Service Bus resources, not only at the namespace level, but also at the entity level. These statistics can be important as they help you to monitor the state of Service Bus. Metrics can also help troubleshoot root-cause issues without needing to contact Azure support. Azure Monitor provides unified user interfaces for monitoring across various Azure services. For more information, see Monitoring in Microsoft Azure and the Retrieve Azure Monitor metrics with .NET sample on GitHub. When there has not been any interaction with an entity for 2 hours, the metrics will start showing "0" as a value until the entity is no longer idle. Azure Monitor provides multiple ways to access metrics. 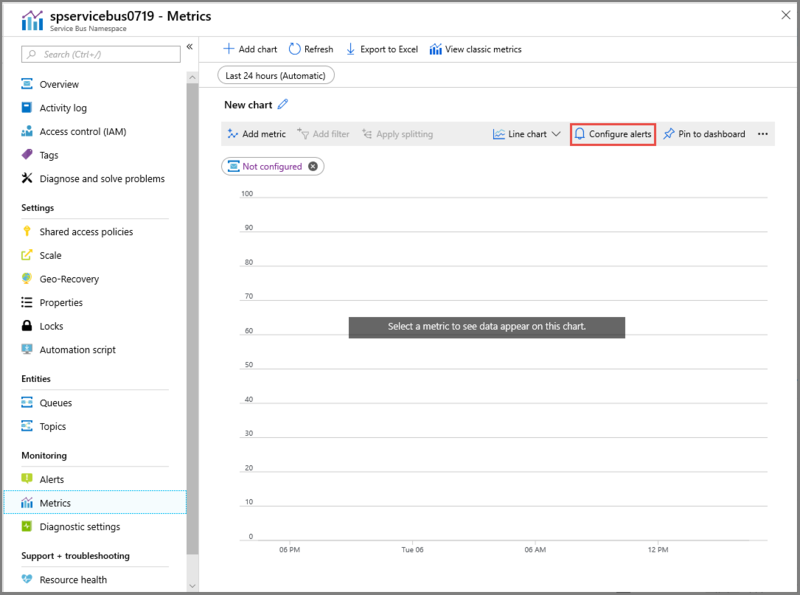 You can either access metrics through the Azure portal, or use the Azure Monitor APIs (REST and .NET) and analysis solutions such as Azure Monitor logs and Event Hubs. For more information, see Metrics in Azure Monitor. Metrics are enabled by default, and you can access the most recent 30 days of data. If you need to retain data for a longer period of time, you can archive metrics data to an Azure Storage account. This value is configured in diagnostic settings in Azure Monitor. You can also access metrics directly via the namespace. To do so, select your namespace and then click Metrics (Preview). To display metrics filtered to the scope of the entity, select the entity and then click Metrics (preview). For metrics supporting dimensions, you must filter with the desired dimension value. 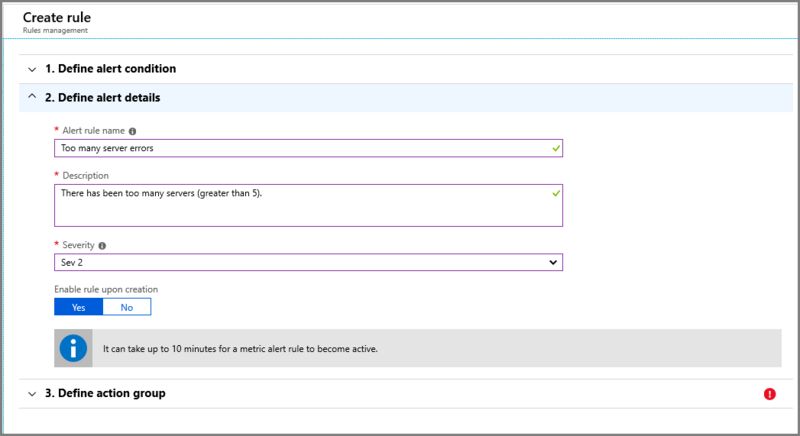 Using metrics in Azure Monitor is free while in preview. However, if you use additional solutions that ingest metrics data, you may be billed by these solutions. For example, you are billed by Azure Storage if you archive metrics data to an Azure Storage account. 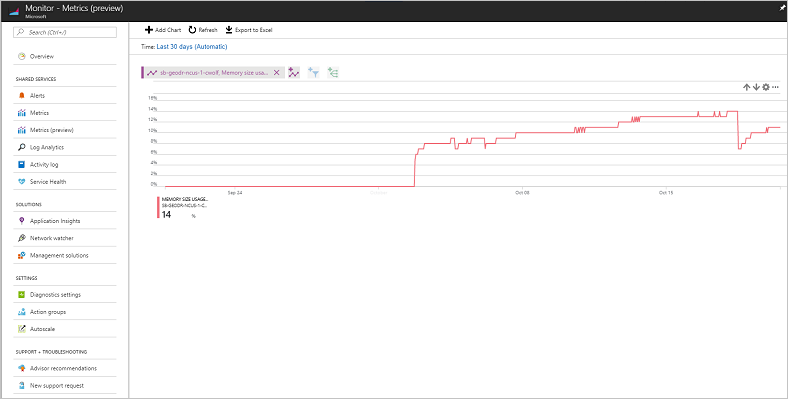 You are also billed by Azure Monitor logs if you stream metrics data to Azure Monitor logs for advanced analysis. The following metrics give you an overview of the health of your service. We are deprecating several metrics as they are moved under a different name. This might require you to update your references. Metrics marked with the "deprecated" keyword will not be supported going forward. All metrics values are sent to Azure Monitor every minute. The time granularity defines the time interval for which metrics values are presented. The supported time interval for all Service Bus metrics is 1 minute. Counts the number of data and management operations requests. Incoming Requests (preview) The number of requests made to the Service Bus service over a specified period. Successful Requests (preview) The number of successful requests made to the Service Bus service over a specified period. Server Errors (preview) The number of requests not processed due to an error in the Service Bus service over a specified period. User Errors (preview - see the following subsection) The number of requests not processed due to user errors over a specified period. Throttled Requests (preview) The number of requests that were throttled because the usage was exceeded. Client-side errors (In HTTP that would be 400 errors). Errors that occur while processing messages, such as MessageLockLostException. Incoming Messages (preview) The number of events or messages sent to Service Bus over a specified period. Outgoing Messages (preview) The number of events or messages received from Service Bus over a specified period. Messages (preview) Count of messages in a queue/topic. ActiveMessages (preview) Count of active messages in a queue/topic. ActiveConnections (preview) The number of active connections on a namespace as well as on an entity. Connections Opened (preview) The number of open connections. Connections Closed (preview) The number of closed connections. The following metrics are available only with the premium tier. CPU usage per namespace (preview) The percentage CPU usage of the namespace. Memory size usage per namespace (preview) The percentage memory usage of the namespace. 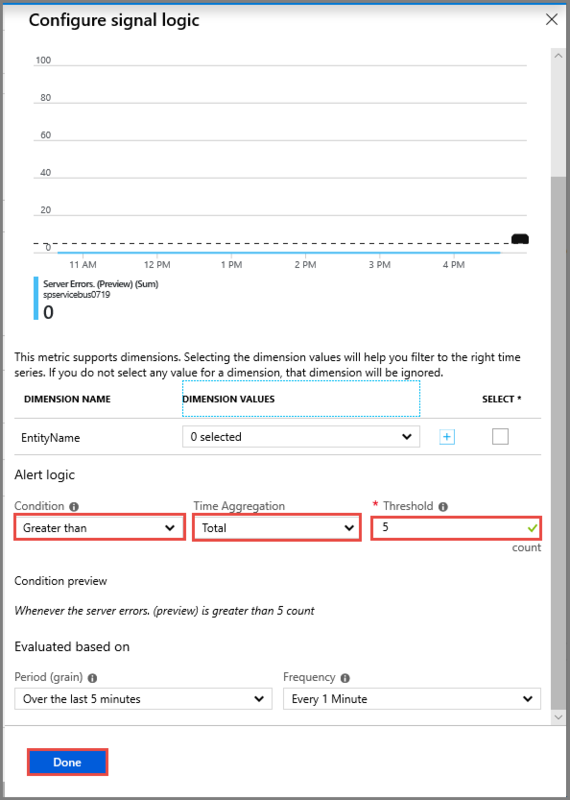 Azure Service Bus supports the following dimensions for metrics in Azure Monitor. Adding dimensions to your metrics is optional. If you do not add dimensions, metrics are specified at the namespace level. EntityName Service Bus supports messaging entities under the namespace. 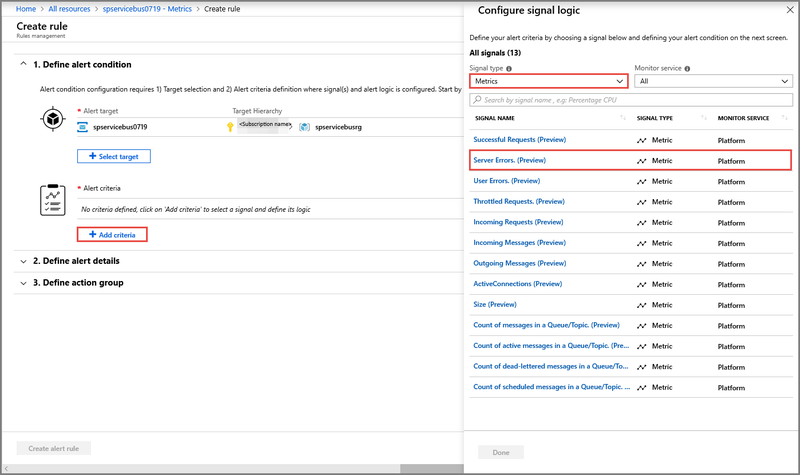 On the Metrics tab of the Service Bus Namespace page, select Configure alerts. 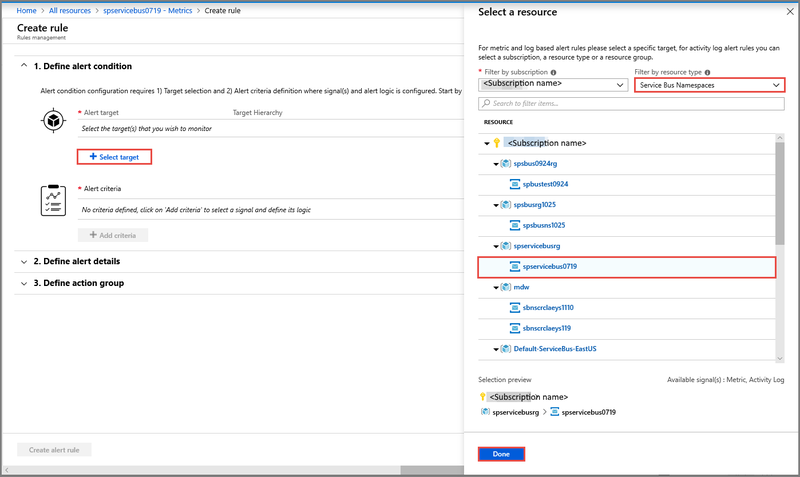 Select Service Bus Namespaces for the Filter by resource type field. Select your subscription for the Filter by subscription field. Select the service bus namespace from the list. Select Metrics for Signal type. Select a signal. For example: Service errors (Preview). Select Greater than for Condition. Select Total for Time Aggregation. Enter a description for the alert. Select severity for the alert. 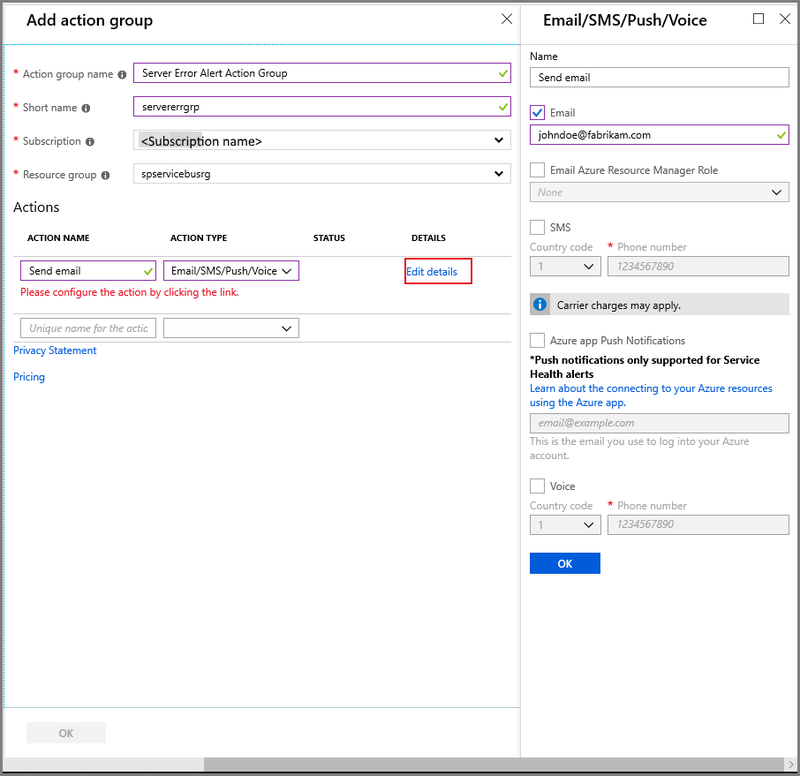 On the Create rule page, expand Define action group, select New action group, and do the following actions on the Add action group page. Enter a short name for the action group. For this walkthrough, enter Send email for ACTION NAME. Select Email/SMS/Push/Voice for ACTION TYPE. 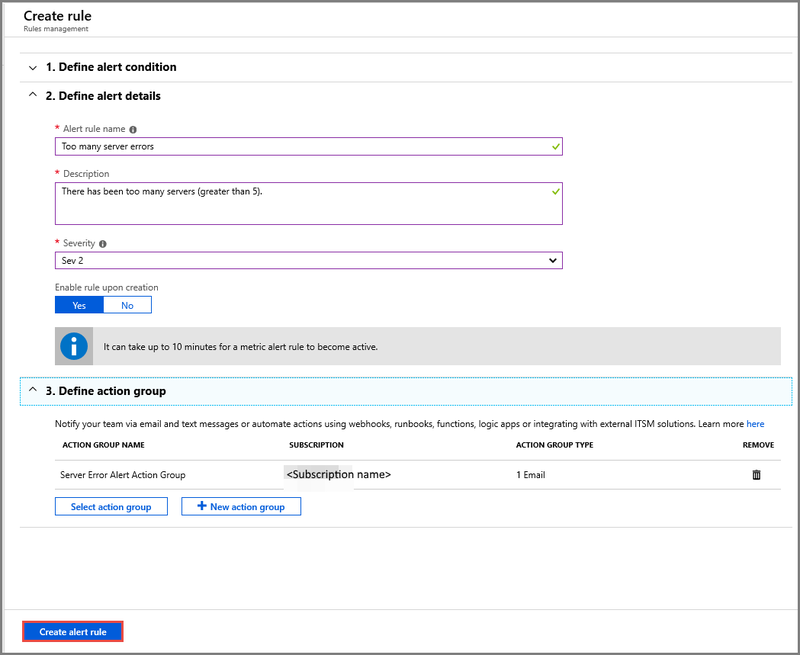 On the Add action group page, select OK.
On the Create rule page, select Create alert rule. See the Azure Monitoring overview.